This was my first time attending the Boise Beer Festival, and frankly I wasn’t prepared for the crush of people in the beer tents and the overall zaniness of the event. Loosely controlled chaos was my first impression, but as you get into the festival, you understand that there is a rhythm that keeps things moving and positive. This is a huge event. I think there were over 30,000 people there, and about 100 tap handles. You can do the math, there were a lot of people waiting in the beer tents for pours. Let me start with some background. 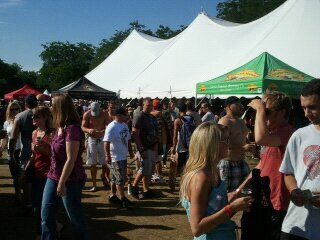 This is the 4th annual Boise Beer Fest and it just keeps getting bigger every year. This year Rick is doing something different. He is taking the festival on the road with the Barley Brother’s Travelling Beer Show. He is organizing festivals in Spokane, and I think Phoenix later in the year. I went to the festival with my Son Brian. Brian is only 19, so he couldn’t drink, but he could drive if Dad over indulged. This didn’t happen. I guess I didn’t know what exactly to expect, so I will just give you a few of my impressions. 1) It was HOT, damn hot. about 95 degrees out. Everyone was sweaty and there was no way to keep that from happening. Perhaps some well placed misting fans would have been appreciated. 1a) When it is hot, I tend to drink more water and less alcohol. So they gave out 5 oz sample cups, and I had about 8-10 of those over a 3 hour period, and drank lots of bottled water! Water stands in the festival grounds would have been appreciated. 2) It was crowded. Out in the pathways between tents and other attractions, it wasn’t too bad, but in the beer tents it was shoulder to shoulder and body to body. I suppose there is really no way to keep this from happening, but it definitely limited my consumption, because to get the brew you had to suffer for it. 3) It was well laid out. They had all the beer tents on one side of the festival grounds when you walked in, and then other attractions and booths in other places. This to my chagrin included several bouncy houses and castles for kids…small kids, more on this later. 4) I was definitely not in the “target Demo” for the festival. Is a matter of fact I think I was at least 10 years over the average age of festival goers. The vast majority on the night I went were in their 20s. I’m in my 40s…late 40s (i’ll be 47 in September). So It wasn’t that I was uncomfortable, but I definitely had a harder time “fitting in”, and no Jim it has nothing to do with my size! 5) Anyone pushing a stroller should not be allowed in the festival. I don’t know if you could tell, but this little guy was just left there while mommy went to get a pour. That is reprehensible behavior. One easy way to make sure this doesn’t happen is simply make an age limit of 18 or 16 so Mom’s and Dad’s can bring their offspring as designated drivers if need be. 6) No Bouncy Houses! Worse than the babies left to fend for themselves were the parents I saw with dreadfully bored 5-10 year olds in tow. Obviously many of these “parents” shouldn’t have been allowed to reproduce. They were treating the kids badly and dragging them around from beer tent to beer tent. It was difficult for me to tell who was behaving worse the parents or the kids. For my money they shouldn’t be allowed in the festival, for their own sanity. This really isn’t a family event. Not that it wasn’t “family friendly” but I think the kids would rather they weren’t allowed to see daddy get snockered and throw them in a bouncy house. 7) the beer was awesome, but it was sporadic. What I mean by this is that there was like I said before about 100 tap handles, but there were over 280 beers, so taps changed as kegs blew. This was really only a problem because I saw that Double Mountain was going to be there, and I was really looking forward to trying their beer. However during the hours I was there nothing from Double Mountain was being tapped. I suppose if all I did was troll back and forth at the taps all day on Saturday and Sunday I would have found it, but I was only there for about 4 hours, and during that time they were not represented. Other than that the beer was great. I had a few standouts. From O’dells I had their Smoked and Oaked Porter which was a smokey bacony treat. I had some Dubhe from Uinta Brewing which is their Imperial Black IPA, which I just adore. I had a saison that was outstanding from Boulevard Brewing. And I had to try the Leinenkugles Summer Shandy. Yes, one of Jim’s favorite Lawnmower beers. Half beer, half lemonade and all refreshing. I had never had it, and ice cold from the taps at a day that was about 95+ degrees, it was a very welcome change of pace. I actually liked it quite a bit, good call Jim. All in all it was a great festival, and my son and I enjoyed ourselves quite a bit. We had smoked turkey legs for dinner and roasted corn from the vendors, and felt like vikings that had just pillaged and plundered. That was fun. It is definitely worth going, and I think it would be better if I had someone to go with that could actually drink with me. Perhaps next year I’ll do a meet-up with a friend or two, or maybe get my deadbeat brother and his family out here. Tags: Barley Brother's Travelling Beer Show, Boise Beer Festival, featured, No babies or Bouncy Houses! Hey Don; Any beer fest is better with a drinking-age friend or two. Sounds as though it was much bigger than the Union Mills fest here in MD. We’ve got fewer vendors but if you get here early the crowds aren’t bad at all. The one thing I don’t like about beer fests is that you usually don’t get time to chat with the brewers and a whole lot of the enjoyment in craft brewing is shooting the breeze w/ the folks who are making those good brews happen. Any chance that the Barley Brother’s Travelling Beer Show will be coming east? I’m pretty sure the Barley Bros will go wherever there is a market for their festival. That was another thing that was kind of lacking. Brewers! Not too many of them. I saw a couple of our local Treasure Valley brewers, but no others from further away, at least that I could tell. Most of the pouring was done by volunteers. You know, we got there at 11:00 Saturday and it was pretty nice. Lines were 2 or 3 deep. Not packed at all. But by 2:00 it was quite packed. For next year, I’ll definitely make a point to get there when the doors open. I was surprised by McCall Brewing. They had a really refreshing ginger, lemon wheat and a smoked scotch ale that was great. Portneuff Brewing was good, too. Really liked their Grog Ale. Thanks for sharing your experience! I’m not sure how I feel about big tent beer events. 30,000 people is insane! And when it’s uber-hot like that, an alcohol infused mob has the potential to start a boat load of trouble. But then again, you’re in Big Sky country, not the crowded and sometimes claustrophobic Northeast, so you guys are probably a bit more laid back. Who am I kidding? I’d be there in a heartbeat! Thanks G. The crowds out west aren’t a problem. Everyone plays nice. It was definitely worth doing. I’m glad I went. I think I’ll go earlier next year. Less crowded and a bit cooler. 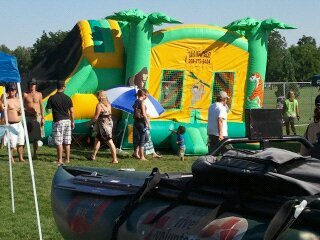 I kinda have a problem with the kids being there and the bouncy house. Not that I hate kids, I just don’t think that’s a great environment for them…especially if some of there parents are drinking and driving home. I’m sure a majority had a DD, but there are always those slim few. The kids were really out of place. This was about the beer, and while they did have a few bouncy castles and other inflatables, this wasn’t an event for them. It either needs to get much bigger and include activities and rides for the kids, or it should just not allow kids under a certain age in. I think they should have to show a drivers permit of some sort, so at least they could pretend to be DDs for their parents or older siblings. And I think there is far more drinking and driving home than we care to admit. Not a big fan of beer festivals as they overcrowded and filled with rude people (at least my perspective anyways). Its a shame because I’m sure there are some good ones out there but I’ll always pass on attending. On another note – I’ll be 47 in September as well…when’s your birthday? Mine is the 25th. There was nothing wrong with the atmosphere here. Everyone was there to have fun, and fun was had. No one was rude, but I am 6’3″ and weigh over 350 pounds. I don’t get messed with, although if they only knew I’m really a big wimp. So that might have something to do with it. But the people here are really laid back and just want to have a good time. Perhaps its geography. On your other note, I had no idea you were such a young whipper snapper. I got 8 days on you. 17th. Did you get to try anything from Southern Tier? If the Boulevard Saison you had was their Tank 7, then you got quite a treat. I had that on tap in Austin and thought it was close to remarkable. Unfortunately, your overall beer festival experience is much like the one I had when I last attended one – Atlantic City (indoors). Far too many people, far too few actually interested in “appreciating” craft beer, and far too chaotic to allow for any good conversation with the brewers. Oh, and at 49, I also suffer the same demographic challenge you endured. Demographic challenges aside, I fancy myself a young 47, and able to chat up just about anyone, so the demographic thing was something I noticed, but not really anything that hindered my enjoyment of the festival. While some were there to just drink all they possibly could, I’d say the vast majority of folks were behaving appropriately. It was just the few that stood out. One other thing that I discussed earlier was there were very few actual brewers there, and the ones who were were so busy pouring that they actually didn’t have any time to banter. Plusa with the crush behind you there was no place to pull out of line to actually talk if you were able to strike up a conversation. Jim and I had a nice about 10 minute conversation with Bill Covaleski from Victory last year at GABF on Saturday night, when things are at their most chaotic. You couldn’t do that here. Too loud, and too crowded. Plus most of the people pouring were just volunteers, not actual brewery folk. I’m pretty sure it was the Tank 7 Saison that I had, but given said chaos I discussed before, it was really difficult to keep track of what I actually got to sample. Next year I will try to get there earlier and keep better track of things. Don’t listen to that Old Fart of an Alemonger. I have seen him in action. He can chat up anyone at the bar at anytime (regardless of age). Last Philly Beer Week he carried the Hammer of Glory from one bar to another bar with the Philly Beer Week organizers and several other people. By the time we hooked up for a Dogfish Head 75 Minute IPA, he was practically holding court. When he’s on, he’s ON. Especially when the topic is Craft Beer. Don, I think I saw you there, but wasnt sure cuz Im relatively new to the site. I was there from about 12-3. We floated the river and then came back around 7:30. If you thought it was crowded and young when you were there..it was a regular frat party near the end. I actually witnessed a guy puking and people taking videos of it. Definitely not condusive to enjoying craft beer at that point. Anyway the festival was incredible and it was really remarkable the volume of great breweries that were represented. Pretty much all volunteers representing breweries though and almost no brewers. I did have a very unique beer that stood out. It was the IPA from Wallace Brewing in Wallace, ID. It was like no other IPA I have ever had before. It was encased with a unique flavor that I really could not put my finger on..maybe a leathery or dried fruity essence, really unidentifiable. I was wondering if you or anyone else on here tasted that beer and could give me some insight. It was the one major take away from the festival. Also, I hope to see some of you in Spokane in 2012 when to Barley Bros bring the Festival up here!